Here we delete a comment field and explain what the "storage settings" field operation means. NOTE: This series is partially complete. We cover the site-building changes from Drupal 7 to Drupal 8 but have not yet discussed the process of migrating a site to Drupal 8. In the "Upgrade to Drupal 8" collection, we get you ready for migrating your Drupal 7 sites or starting new projects in Drupal 8. Even if you're not ready to move to Drupal 8 just yet, this series will clearly lay out the benefits so you can decide when the best time will be for you or your organization to make the shift. The series starts by highlighting each change in the user-facing interface. Identifying these changes will help you translate your workflows to Drupal 8, and will also give you clues about how the underlying architecture of Drupal has changed. These videos will be useful to virtually anyone who might work with Drupal 8. Once we've taken a complete tour of the interface changes in Drupal 8, we will look at how to migrate your data, themes and custom modules over to 8. While these later videos will be more developer-centric, we will try to keep them as clear as possible so that those of you who may not be programmers but are responsible for the migration process can still benefit. If you're curious about the changes that have been made to Drupal 8 from a site building and user interface perspective, the first part of this series will help you quite a bit. The rest of the series will be valuable to developers or site managers who want to migrate part of all of a site to Drupal 8. 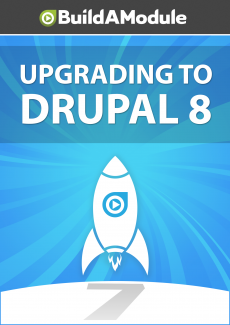 If you're responsible for figuring out if upgrading to Drupal 8 from Drupal 7 is logistically feasible, this series will help you get a handle on the time and effort involved in the process. This series will be most valuable to those with previous experience working with Drupal 7, either as a site builder, back end or front end developer. The first part of this series is focused on site building, and the later videos will assume some familiarity with programming and Drupal 7 theming. 2:05Welcome to "Upgrading to Drupal 8"
2:19Why parts of the content type "manage fields" interface has been moved to "manage form display"